Hands-on with the game's fourth major update. Three of the four of our little squad are huddled in a tiny cabin, waiting out a life-threatening blizzard on a snowy planet. I’m playing No Man’s Sky Next—the fourth update for the game since launch and the one which brings true multiplayer to the game’s enormous universe—with three of the development team. All four of my team started a new game for this demo so everyone is working through the new version of the game’s introduction. We’re learning the basics of resource gathering and tech creation needed for the meat of the experience: base-building and adventuring. To that end it introduces you to base-building and freighters earlier than before. But right now I’m out of Sodium—a new harvestable resource which I need to recharge my exosuit’s thermal protection—and my life support system is also perilously low. Hence hiding in a cabin after collecting a piece of tech I need to repair my starship. The jog here nearly killed me so the jog back seems a bit of a gamble. Where I’d usually have to figure out a survival strategy on my own, multiplayer offers a new lifeline. One of my new friends drops a heap of Sodium (and some Oxygen for my life support) into my inventory and I’m suddenly good to go. To share resources you hover over the element in your inventory and can choose to transfer it to a fellow player in your immediate vicinity. Sharing is also why the game now lets you split stacks of resources, so you don’t need to absolutely inundate someone with all the Carbon you own when they only need enough for a floor tile. I attempt to return the favour at a later date, offering up a supply of Copper as we build the necessary bits to unlock a base computer. A base computer is what you need to start a base and thus we start throwing up walls, floors, lights and goodness knows what else, with surprising speed. I decide to build a magnificent bridge from the slope we’re on to another peak. I run out of Carbon after placing about five floor tiles and curse my hubris. Luckily my squad helps out and, by the time I return from another round of mining, it covers a far more impressive distance. You can pursue the No Man’s Sky story path together or just explore or muck about, racing exocraft, creating scenic trails, taking on missions as a group, or building extravagant structures. The ability to experience the world alongside other people is turned on by default. Players can switch it off if they want to be truly alone, but the way Murray explains it, having it enabled won’t suddenly lead to those strange agglomerations of player characters you see in MMO questing hotspots. He comes back to that story later in the day to illustrate how the existing No Man’s Sky experience sets up slightly different multiplayer expectations than other games. I only reached base building towards the end of my hands-on with the game (partly because there was a certain amount of hiding in cabins, barging one another with starships, and deploying all of the emotes in the quick task bar to see what they did). So it was in conversation with Murray where I learned about the rest of what Next will bring. Until now you could only set up home by finding an abandoned habitable base on a planet, so you weren’t able to just set yourself up near an attractive cave system or a glut of useful resources. You could also only build your base out a certain distance from that point. Next will remove both of those restrictions, letting you build anywhere and letting you sprawl all over the place. For a brief rundown: there are hundreds of new base building parts and you can own multiple bases per solar system and per planet. From what I saw, the new building components also make the building architecture look very different—they tended to be more angular and more wood-focused, although that could be due to the materials available or what gets unlocked early versus later as you research new parts. There’s potential for cities, or at least neighborhoods of some kind, as other people can build bases alongside your own, or you could simply throw down another base computer and start a new structure yourself. Given my particular group of friends, it’s also good to know that when playing together there’s nothing too destructive they can really do to my base, and when I’m not online they can only see my base, not edit it. Murray says that you can now assemble fleets of frigates, too, walking around on them, repairing them and specialising them for discovery, trade or combat. He adds that you can also build rooms for captains on freighters and then deploy them on missions. Depending on your fleet you can take on different missions, explains Murray. “When you send them off they go to those places for real. You can follow them round, they sometimes get into trouble—things like that. And when they return they will potentially give you rewards, they will give you a big report of everything that’s happened which is quite fun. In terms of the missions you and your team of human players can take on, I see things like resource collection and scanning creatures on one list, but apparently there are also activities like freighter battles. While we’re on the subject of freighters, Murray points out that you can now land on them. The layout has changed too, to make it more obvious that you can base-build in freighters. I gather that’s something people often missed, like the adjacency bonuses you can get by organising your inventory in a particular way. To go back to my hands-on experience, I was tentatively excited by how quickly the experience slipped into that “titting about with mates” headspace, sniggering as a copper deposit I’d tagged but then mined out led a companion to an empty hole. The mood felt somewhere between Viscera Cleanup Detail (a game about being a space janitor which you can play with your friends and ruin their clean floors by treading blood everywhere) and Minecraft (where I tended towards pottering about on a server, occasionally collaborating, but mostly working on my own projects). It’s impossible to say how the experience will settle over the longer term—over the hundreds or even thousands of hours the No Man’s Sky community pours into save files—but the foundations feel promising to me. And I say that as someone who has previously played a determinedly lonely version of the game, just skipping from planet to planet and making videos of particularly dorky animals or taking screenshots of weird landscapes. The community is getting a particular shout-out after Next launches, thanks to the Galactic Atlas website. It seemed to be part travel guide, part activity hub from the screenshots I saw. The idea is to be able to offer context for the galactic map, pointing out places of interest or information about galactic hubs and their discoveries. There’s also a shop. Not in the sense of a microtransaction or loot box experience, but as a place where players can spend in-game currency earned through doing community missions. The idea is that people can pick up unique cosmetics, emotes, base building parts and so on which mark or celebrate their community involvement. It made me think of the emblems and shaders I amassed in Destiny as a kind of “I was there!” statement for raids. Speaking of cosmetics, you can also customise your player character, either taking on the form of a space traveler in the human astronaut vein, or as one of the game’s NPC races, like the Gek or the Vy’keen. Customisation feels more important in Next than other updates, partly because in multiplayer it’s nice to be able to tell people apart at a glance instead of using a default form and relying on the coloured markers on your HUD, and partly because the game will now default to a third-person camera view, meaning you’ll spend a lot of time looking at your character unless you switch back to first person. As with the previous mega updates, Next feels too big to be able to summarise everything here, and a lot of the changes which will make a lot of difference to players will be under the quality of life heading rather than the eye-catching trailer stuff which gets prioritised in top-level explanations. For example, I’m excited about being able to build a base underwater, but ecstatic about being able to drag and drop resources from one inventory slot to another. After Next launches, the team will be watching to see what players do with multiplayer. “It’s such a different stage,” says Murray. How players engage with the game, with these new tools and experiences, will inform how it evolves. But it will start to do so on via a smaller, more regular cadence. Until now we’ve seen massive updates which tend to rewrite both the philosophy of the game and large parts of the player experience. 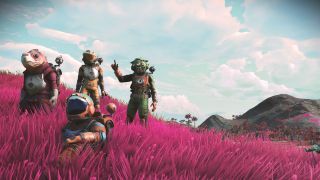 But shortly after Next is out in the wild, Hello Games will switch to weekly updates as the team continues to work on the game. There’s no confirmed date for that yet, though.